For patients diagnosed with glioma, a deadly form of brain tumor, the future can be very uncertain. While gliomas are often fatal within two years of diagnosis, some patients can survive for 10 years or more. Predicting the course of a patient's disease at diagnosis is critical in selecting the right therapy and in helping patients and their families to plan their lives. Researchers at Emory and Northwestern Universities recently developed artificial intelligence (AI) software that can predict the survival of patients diagnosed with glioma by examining data from tissue biopsies. The approach, described in Proceedings of the National Academy of Sciences, is more accurate than the predictions of doctors who undergo years of highly-specialized training for the same purpose. Doctors currently use a combination of genomic tests and microscopic examination of tissues to predict how a patient's disease will behave clinically or respond to therapy. While genomic testing is reliable, these tests do not completely explain patient outcomes, and so microscopic examination is used to further refine prognosis. Microscopic examination, however, is very subjective, with different pathologists often providing different interpretations of the same case. These interpretations can impact critical decisions like whether a patient enrolls in an experimental clinical trial or receives radiation therapy as part of their treatment. "Genomics have significantly improved how we diagnose and treat gliomas, but microscopic examination remains subjective. There are large opportunities for more systematic and clinically meaningful data extraction using computational approaches," says Daniel J. Brat, MD, PhD, the lead neuropathologist on the study, who began developing the software while at Emory University and Winship Cancer Institute. Brat currently is chair of pathology at Northwestern University Feinberg School of Medicine. 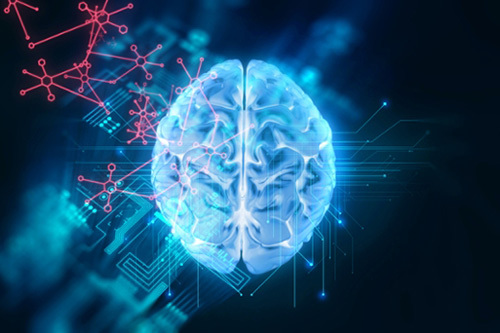 The researchers used an approach called deep-learning to train the software to learn visual patterns associated with patient survival using microscopic images of brain tumor tissue samples. The breakthrough resulted from combining this advanced technology with more conventional methods that statisticians use to analyze patient outcomes. When the software was trained using both images and genomic data, its predictions of how long patients survive beyond diagnosis were more accurate than those of human pathologists. The study used public data produced by the National Cancer Institute's Cancer Genome Atlas project to develop and evaluate the algorithm. "The eventual goal is to use this software to provide doctors with more accurate and consistent information. We want to identify patients where treatment can extend life," says Lee A.D. Cooper, PhD, the study's lead author, a professor of biomedical informatics at Emory University School of Medicine and member of the Winship Cancer Institute. "What the pathologists do with a microscope is amazing. That an algorithm can learn a complex skill like this was an unexpected result. This is more evidence that AI will have a profound impact in medicine, and we may experience this sooner than expected." The researchers also demonstrated that the software learns to recognize many of the same structures and patterns in the tissues that pathologists use when performing their examinations. "Validation remains a barrier to using these algorithms in patient care. Being able to explain why an algorithm works is an important step towards clinical implementation."